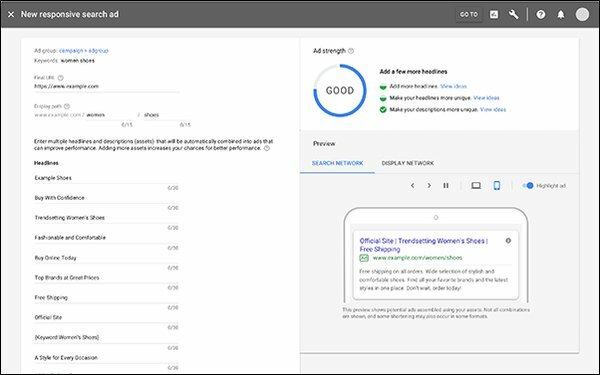 Google will release details on ad strength as a column in early September, and in the responsive search ad creation interface during the next several weeks. Support for responsive display ads will follow in the coming months. The company suggests providing as many distinct headlines, descriptions, and other assets as possible to help the machine learning technology generate a larger number of relevant, effective ad combinations. Best practices for this feature requires marketers to provide at least five or more headlines and descriptions that make sense for the business. For a responsive display ad, marketers should provide up to 15 images and 5 logos, headlines, and descriptions per ad. Making it easier for marketers to create more effective responsive search ads, Google now provides a way to preview ad combinations as they are being built. This shows what the ads might look like. The feature also allows marketers to double-check their work through them. The platform also enables marketers to view reporting for headlines, descriptions, and top combinations to help them see what is showing up most often on the search results page. Best practices, for example, means that all search ads groups should contain three or more ads, including a responsive search ad. Marketers can pair them with three ad extensions and the ‘Optimize’ ad rotation to make sure ads are as relevant as possible. Using responsive search ads, for example, Apartments.com created relevant ads at key moments in the rental process. As a result, the company saw a 10% lift in clicks. ForRent.com, another brand in the Apartments.com network of sites, saw a 16% lift in clicks with a similar strategy. For app marketers using Universal App campaigns, Google’s machine learning automatically combines the creative assets with content from the app store page to create personalized, relevant ads. Best practices for this feature suggest that between four and five text, video, and image assets should be provided in varying lengths and sizes. Marketers looking for more guidance can find information in an online course to help design and optimize creative for a Universal App campaign. 1 comment about "Google Introduces 'Ad Strength,' New Metric Measures Relevance". Doug Garnett from Protonik, LLC, August 27, 2018 at 7:12 p.m. This is pretty funny. Given how inadequate Google Analytics are (providing data - but not enough data to really dig deeply with), why would we expect they can evaluate "relevance"? And if you're tracking already you already have plenty of data with the way the search ads are being clicked to know whether you're relevant or not. Google, once again, promises to tell us "everything" when they really can't tell us much more than they already do. Is this a general tech disease becuase they're not the only ones doing it.